Beyond Sustainable, a new weekly blog from Homesteaders Supply! Here we will highlight articles from homesteaders and related helping organizations blogging about their experience and insights for creating a sustainable lifestyle. Many of these articles will demonstrate their creative ingenuity for income, insights into the care of the land and their animals, and how to effectively grow, preserve, and prepare the foods we need for a healthy lifestyle. We will also highlight articles from organizations that are helping us in our efforts toward a healthy and sustainable lifestyle. a blog from our friend Shannon Hayes, author of the book Radical Homemakers, and more. “This story has been popping into my mind a lot these past few weeks as I listen to the media, neighbors, and friends discuss the Affordable Care Act. In spite of the approximately 50 million Americans who are uninsured, I am hearing folks express a lot of fear of the unknown. Some who are uninsured are defiantly choosing to pay the tax penalties rather than purchase a policy. Some are seething with anger that their tax dollars will be paying for someone else’s healthcare. Others are simply petrified that if they move forward and enroll in the exchange, they will suddenly be without any coverage. As a nation, we are being asked to take the first steps to leave behind a cruel relationship. We are collectively confronting a great big unknown. Suddenly, all the homelessness, suffering, and bankruptcy offered by our current system seems preferable to confronting something new and different. 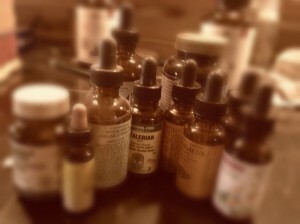 It is as if we’ve become co-dependents to our existing abusive healthcare system.” read more…. “It seems almost sacrilegious to question the wisdom of Julia Child. 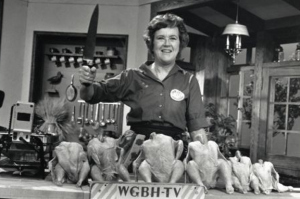 First with her opus Mastering the Art of French Cooking and later with her PBS cooking show, the unflappably cheerful Child helped rescue home cookery from the clutches of convenience food. She taught us how to love — and take pride in — making something from scratch. 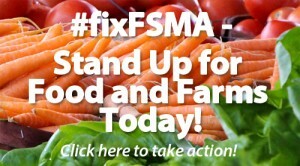 Stand Up Today for Food and Farms! 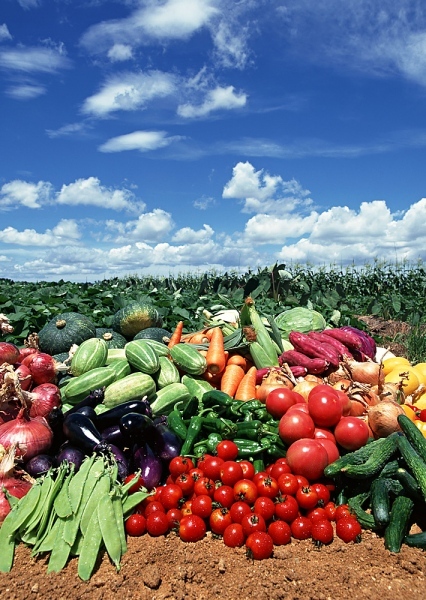 The US Food and Drug Administration has proposed new rules this year that will have a huge impact on how fresh fruits and vegetables are grown and processed in the US. 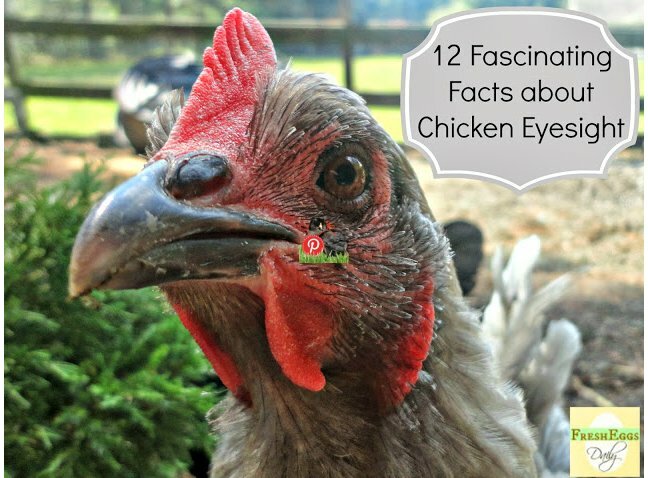 This is a big deal for farmers and eaters! Everyone has a role in ensuring safe food from field to fork – but FDA’s new proposed rules as written will unfairly burden family farmers, target sustainable and organic farming, and reduce the availability of fresh, local food in our communities. Right now, we have a chance to tell FDA that this is unacceptable – and we need your help to do it. increase the use of chemicals rather than natural fertilizers. Now stand up for your farmer, stand up for your food! This entry was posted in Beyond Sustainable on October 26, 2013 by Homesteader's Supply. New Product for Homesteaders Supply: Dynablend Blender with Unbelievable Options and Price Value! We have just added a new product to our Homesteaders Supply webstore, and as most of you know we try to only have the best products out there. We want our customers to have a quality product that will function as advertized and not have to break the wallet to afford it. Newly offered product from Tribest is the Dynablend Horsepower Plus Blender designed to provide the power and capability that all other high power blenders do, but with added features and a reasonable price. 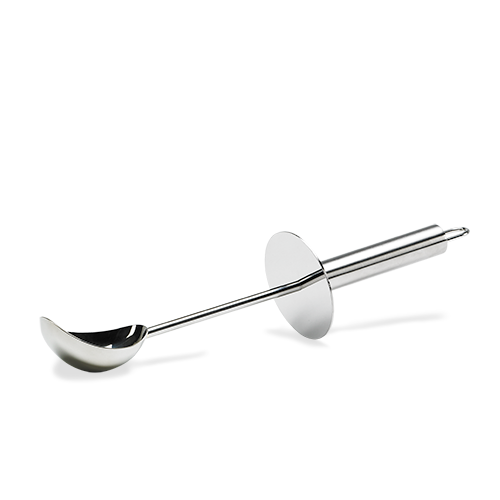 Comes standard with a heavy-duty glass pitcher and a versatile stainless steel utility scoop that can be used as a tablespoon sized measuring scoop or an agitator. 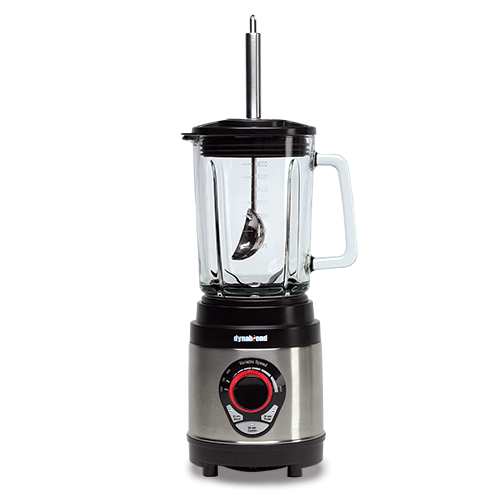 Other blenders on the market usually only feature these items in plastic these days. It has a powerful 1+HP motor, unlike other small models with smaller motors that can’t keep up with tough jobs. Motor provides for both variable speed control AND pre-programmed settings. Unbeatable price point for such great value. You really can’t beat the great low price with such high value on this product… the glass pitcher, the stainless steel agitator, the options of manual variable speeds AND the automatic settings! With the manual variable speed, from low to high, and the convenient automatic settings: 60 second blending, 30 second pulse, or 60 second blend and pulse combination, you can choose your blending speed. Now you don’t have to worry about the plastics, or whether it’s BPA free or formaldehyde free… even if it will stain or wear out. 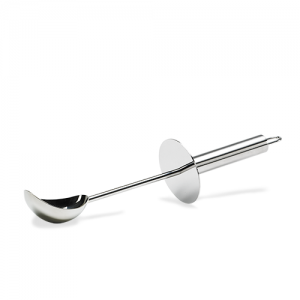 We were so pleased to see this product with a glass pitcher and stainless steel agitator. 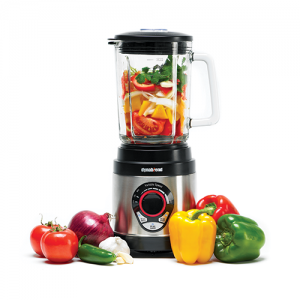 Now you can make your salsas, soups, protein drinks… and yes even to make your butter! Want to know how to make butter in a blender? Ask us! This entry was posted in New Products on October 11, 2013 by Homesteader's Supply. Do You Know About the Non-GMO Project? We all have heard about the GMO controversy. It has been suggested that 80% of our food in this country is derived from genetically altered food sources. The most common GMOs are soy, cotton, canola, corn, sugar beets, Hawaiian papaya, alfalfa, and squash (zucchini and yellow). The biggest, and yet unsolved issue is how these GMO foods are affecting us when we consume them. Don’t forget, it’s not just not our fruits, veggies that can affect us, but what about the meat products we consume? 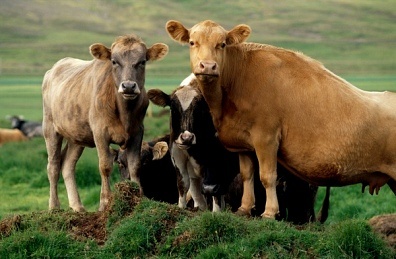 Most of our meat supply is being fed with GMO containing feeds. We just don’t know all the ramifications of ingesting genetically altered foods. Some suggest that GMOs can be toxic, less nutritious, and cause allergy based illness such as asthma, auto-immume disorders, digestive problems, etc. The fact is that there has not been enough research before the onslaught to the American consumer. But there is plenty of information out there to show us that we should take care in what we feed our family and our animals. 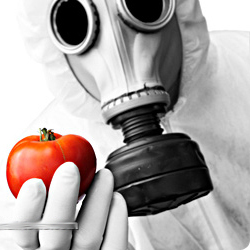 You can read for yourself the extensive report GMO Truths and Myths from Earth Open Source. And for those of you still not convinced that we are actually exposed to so much genetically altered foods, here is a bit of information that may help change your mind. Monsanto is trying to corner the market with their variety of GMO for Sweet Corn, which swept the county by storm hitting the grocery stores, farmers markets and farmstands in 2012. It is being being sold not only as fresh corn, but you can find it as frozen and canned products. 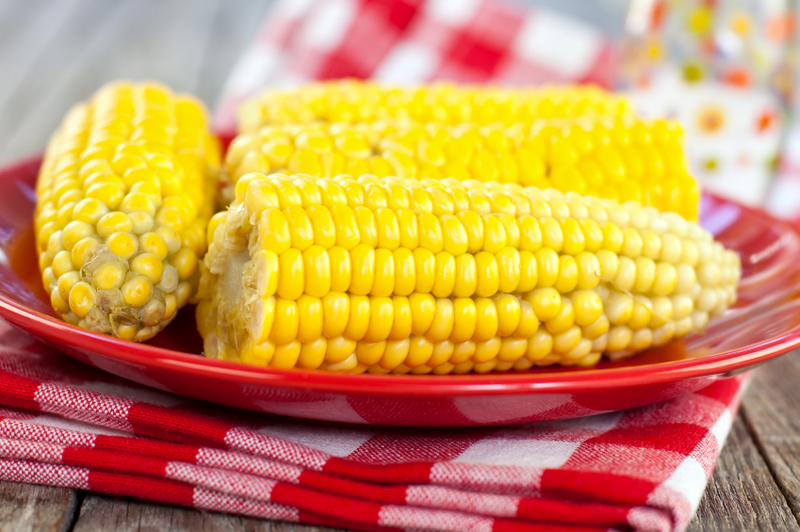 According to the Non-GMO project, GMO sweet corn is genetically engineered to be herbicide resistant (Roundup Ready) and to produce its own insecticide (Bt Toxin). Like all GMOs, genetically modified sweet corn has not been thoroughly tested to ensure that it is safe for consumption. Want to know what brands and products are verified Non-GMO products? Check this out at the Non-GMO Project… it’s one of the things they provide for us! And then make sure you buy Heirloom, Organic, Non-GMO seeds for your garden and create your own harvest for your table! This entry was posted in Preparedness, Uncategorized on October 8, 2013 by Homesteader's Supply. Simple little seed is chock full of beneficial nutrition! 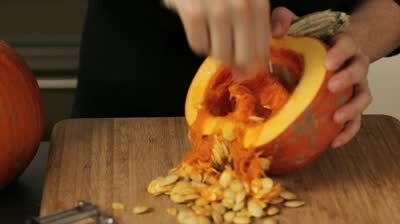 The most commonly known carving pumpkin, the Jack-O-Lantern, was not bred for eating. The Smaller sweeter pumpkins are for eating. Colors of pumpkins are just as diverse, such as the blue Jarrahdale from New Zealand and Queensland Blues from Australia. Pumpkins are considered a fruit because it contains seeds. 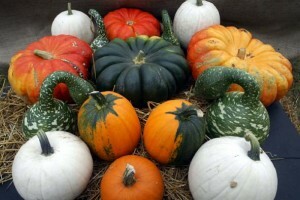 Pumpkin can be used for soups, stews, bread, pickles, pies, puddings, ice cream, and even beer or ale! Cattle, goats, pigs, chickens and turkeys all love pumpkins. 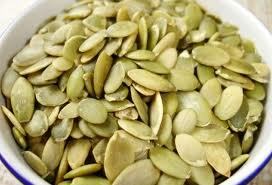 Most pumpkin seeds have hulls, unlike the Kakai Pumpkin seeds are completely hull-less. Mexican mole sauce is made with pumpkin seeds. Contain lots of minerals such as zinc, iron, copper, magnesium, phosphorus, and manganese… for helping to optimize bone health and preventing osteoporosis. They have been shown to reduce LDL cholesterol, improve prostate health, reduce inflammation related to arthritis, improve sleep and lower depression. The only alkaline forming seed. Contain high quality protein, and the content of protein actually increases with the age of the fruit. Best to shell the seeds, then soak in water for 6 hours. Soaking make enzymes and other nutrients more digestible. Bake them in the oven at 160 to 170°F for 15 to 20 minutes. You can even sprinkle different seasonings on them for a variety of flavors. Many suggest dehydrating below 110 degrees F, will prevent of loss of nutritive value from over-heating. 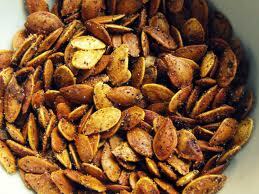 Sprinkle them on top of salads, cereals, and yogurt. Add them to soups, stews, and meatloaf. Enjoy them raw as a snack! This entry was posted in How-To on October 6, 2013 by Homesteader's Supply.